We need to release cobia! Cobia info by Don Hammond, SCDNR! Most of the large targeted fish entering the sound are spawning females and are not protected as red drum are. A 2 per person limit could, under ideal conditions, allow a boat of four fishermen to bring in over 400 pounds of cobia to the dock. Any fish over 50 pounds is likely to be a spawning female. 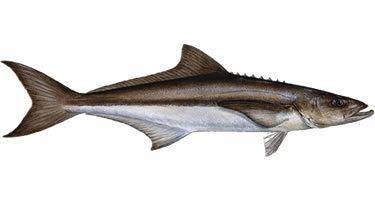 Cobia do not have game fish status, thus with the correct permits, they can be sold commercially by anyone. As cobia are known to travel up to 15 miles inland they are within range of all fishermen from boats or shore. During the season, as many as 100 boats have been counted in the Broad River seaward of the bridge, fishing for cobia. Up until 5 years ago no research was done on the habits or the health of the local stocks. Several more years of study are necessary to reach some meaningful management conclusions. Other than their dependence on calico crabs, we do not even know enough about their food chain to tell if the pollution from development affects this fishery. Although the perception of the health of the cobia fishery in general is good and deserves a "B" grade, we do not know enough about the species to tell whether it is getting better or worse or are we able develop any management tools that rely on anything other than common sense. The good news is that SCDNR has rapidly elevated their research of cobia over the last two years and the Waddell Mariculture Center has developed a very efficient stock enhancement program that we can use in case of disaster. In the last three years they have stocked over 70,000 cobia in our waters. The fishing community has also expressed strong sentiments about proactively placing stronger catch restrictions than the federal rules for state waters. The state of Florida had already done so several years ago because of rapidly increasing numbers of fishermen. Once we know more about cobia and we have management tools in place as good as the red drum ones are, then a rating of "A" is achievable.